A collection of over a million species of insects on display in the Municipal Museum in Grecia. Open-air exhibition of snakes of the world, including a special section on snakes of Costa Rica. 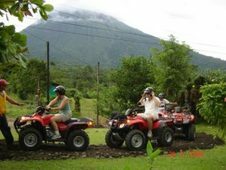 A “Monteverde-like” private reserve containing roughly 2,000 acres with nature trails good for hiking and riding. SarchíA small colorful town known for its’ handcrafts and painted ox-carts. 12,458 hectares of which 60% is primary forest with beautiful waterfalls, and abundance of wildlife including the elusive Quetzal, however very little tourist infrastructure exists. This is the perfect place to enjoy natural sightseeing. Since the refuge is found on the low-lying northern plains, water is the key word. During the area’s dry season, the refuge can be accessed by road, but during the rainy season – boats are the answer. In the area of the lowland keep on the look out for sloths and anteaters in the treed area, while birders will find a cornucopia of subjects for their binoculars and cameras. White cranes and ducks abound in the shallow along the rivers. 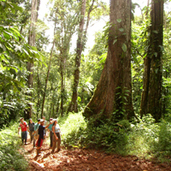 1,500 hectare biological reserve adjacent to Braulio Carillo National Park, owned and managed by the Organization for Tropical Studies, a consortium of international universities dedicated to rain forest research. The U.S. Academy of Sciences has recognized La Selva as one of the four most ideal places in the world for this kind of research. Rio Fortuna WaterfallHiking trails and a great swimming hole at the base. Very primitive network of large caves, underground river, and stalactites and stalagmites. A world-class spa which offers a variety of services: five amazing natural hot mineral water pools in temperatures ranging from 80 to 102 degrees F., an indoor turbulent hot tub, natural hot springs and waterfalls, all surrounded by incredible ecological gardens. 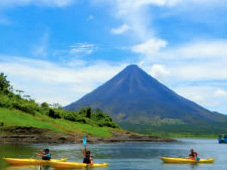 In addition, there are massage and mud masks treatment available, exotic cocktails and tropical drinks served in its’ three bars, and exquisite Italian and Costa Rican cuisine is featured in the restaurant overlooking the volcano. Collection of over 2,000 species of plants from all over the world.